Valentine's Day is just around the corner. The perfect day to reach out to those special people in our lives and give them a token of our appreciation and love for them. It is actually the perfect day to reach out to teleflora, a popular floral service that delivers hand made bouquets directly to your door. 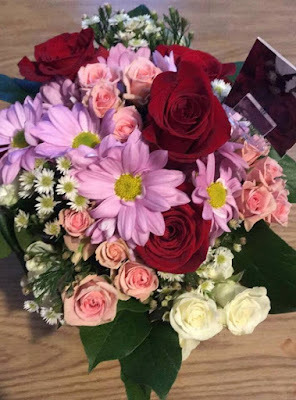 All the bouquets from teleflora are gorgeous. It is hard to choose a favorite. I received the Country Sweetheart Bouquet. I love this vintage chic French farmhouse style arrangement. 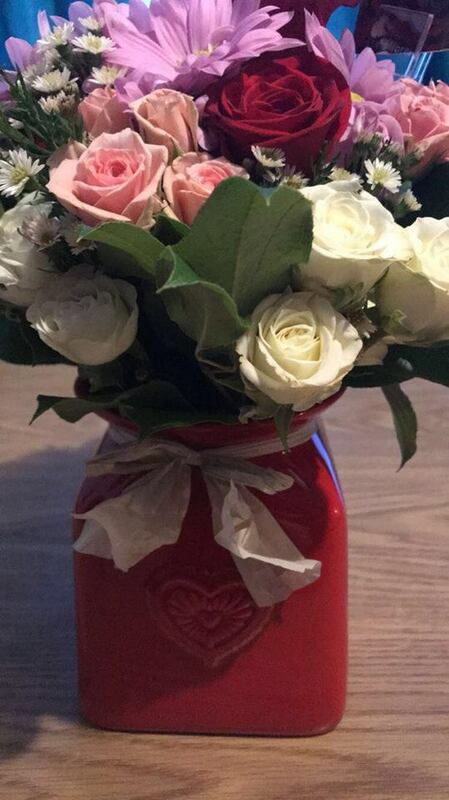 It is a beautiful little red crock filled with bursting roses, white Daisies,, red Carnations and a mix of Dusty Miller and Huckleberry. A bouquet from teleflora is going to fill your rooms with a settle whiff of a beautiful garden. These bouquets are not over whelming. A nice thing is you can reuse the crocks and containers the bouquets arrive in. These are a perfect way to say "I love You" and it isn't going to break the bank. These bouquets are available in standard, deluxe and, premium size options. 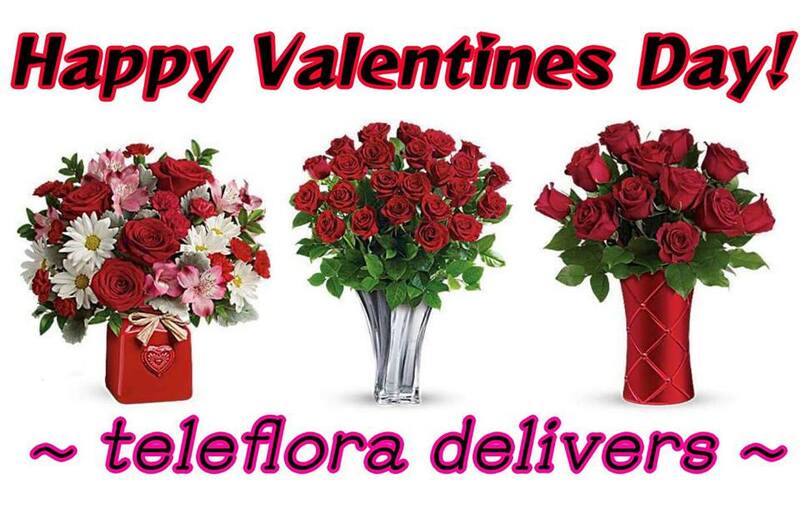 If you are unsure, there is a network of professionals at teleflora standing by to help you out. Other gorgeous options for Valentine's Day are teleflora's Sweetest Satin Bouquet. This is an elegant arrangement brimming with classic red roses, white Asiatic lilies, red Alstroemeria and green accents. This beautiful, bouquet arrives in a ceramic vase with a soft, satiny gloss and quilted pattern that evokes a passionate feel. They also have the teleflora's Sterling Love Bouquet. This features a modern touch of luxury, this Sterling Love Bouquet features a stunning vase overflowing with fresh red roses, pink Asiatic lilies, and red Alstroemeria. Large and loving, this option will be treasured for years to come, every time she reuses this vase. 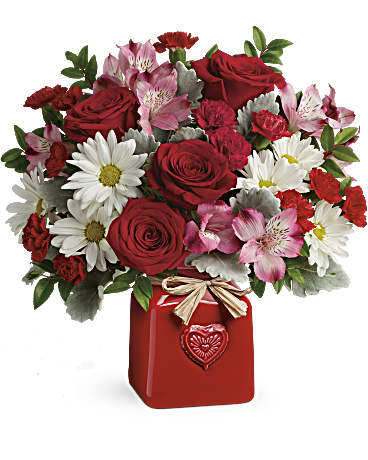 Teleflora's Happy Harmony Bouquet is a playful pattern of red and silver hearts on a beautiful glass cube. The flowers inside are brimming with joy. Teleflora has something for every occasion. Whether your looking for something for a birthday, anniversary or a funeral, they have you covered with gorgeous ways to let people know that you care. These are 100% hand made and can be ready the same day. These are a beautiful inexpensive way to let someone know how much you care this Valentine's Day. There is such a beautiful variety of flowers to choose from. I love flowers this time of year. It's so gloomy and gray outside, flowers can brighten the day.